Sunday night's premiere of "The Walking Dead" brought in a monstrous 17.3 million to give the series its best ratings ever. It looks like there will be "No Sanctuary" for those trying to go up against AMC's apocalyptic mega-hit. That's a reference to the season five premiere of "The Walking Dead," which attracted a monstrous 17.3 million viewers to AMC, the show's best performance to date. 11 million of the viewers were in the key 18- to 49-year-old demographic. The ratings record was all the more notable because the episode was up against NBC's "Sunday Night Football." Football is perceived to be must-see TV, the kind of event programming that should be seen live -- but for a lot of people, that description fits "The Walking Dead," too. AMC president Charlie Collier made that point in a celebratory statement when the ratings came in on Monday afternoon. 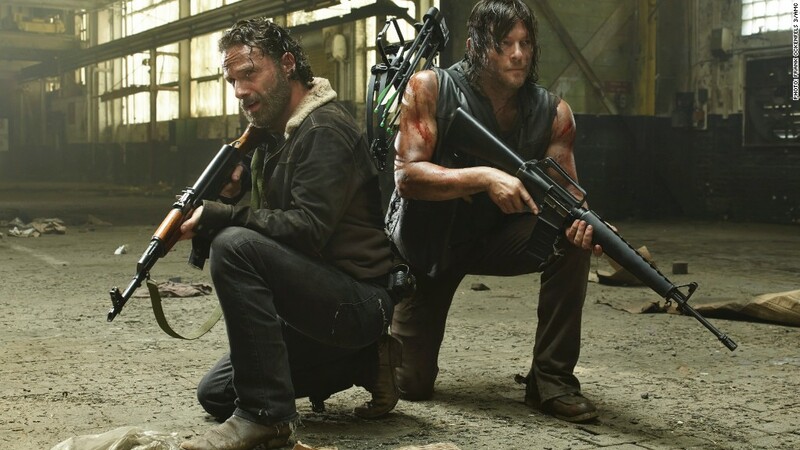 "'The Walking Dead' is one of those increasingly rare shows today that can command a live audience not significantly cannibalized by time-shifted viewing," Collier said, giving a wink to those who watched the prior night's bloody premiere. Still, time-shifting is a factor, as it is for all scripted series; the cable channel projects that once digital video recorder viewership is counted in the ratings, Sunday's episode will exceed 22 million viewers. When the series was introduced on Halloween four years ago, it garnered about 5.3 million viewers. At the time, that was a record for AMC; "it's a good day to be dead," Collier said when the ratings came in. Since then, the show has just kept growing and growing. Sunday's season five premiere brought in almost two million more viewers than last year's finale. It's no wonder why AMC ordered a sixth season of "The Walking Dead" before the fifth season even debuted. Or why AMC is expanding the franchise by creating a spin-off series that will follow different characters in the same zombie-filled world. The channel already has "Talking Dead," a talk show that follows each new episode of the series. On Sunday "Talking Dead" delivered an impressive 4.5 million 18- to 49-year-olds and 6.9 million total viewers. That means the 10 p.m. talk show out-rated several of the scripted dramas and comedies on network television on Sunday night.